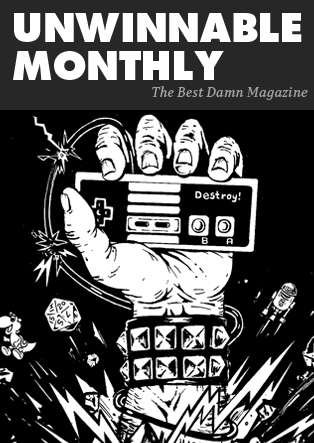 In a world where geek culture is becoming ever more pervasive, where videogames sell millions of copies and comic books are adapted into blockbuster movies, there still remains one hobby that rides along the edges. There is still one hobby that is shunned by the mainstream. Join me now as we explore the world of tabletop role-playing games. Join me, the TABLETOP WIZARD! Imagine you were casting a commercial for a role-playing game. What would your set look like? Your actors? Your props? You’d probably choose a dinner table scene – to try to get away from the whole “playing in the basement” thing that haunts RPGers. You’d cast both men and women, probably more men, which is most likely statistically accurate. You’d populate the table with chips and soda, with game books and dice; and then to show your viewers who is the Game Master, you’d probably have him behind a GM’s screen, right? I can see it now, his sallow face scanning the room, bags under his eyes due to lack of sleep, fingers marred with pencil lead from drawing and redrawing maps on blue-gridded graph paper, the bottom part of his face – likely hiding a sadistic leer – hidden behind a protective screen. Almost by default, when I think of a Dungeon Master, Keeper or Game Master, one of the first things that pops into my head is player characters crying out for mercy. The second thing is that all-important prop – the GM screen. First, let’s discuss what a GM screen even is. It’s a literal screen, usually a long piece of folded cardstock or cardboard that unfolds into a variety of panels. On the outside, facing the players, is usually an illustration depicting an exciting scene based on whatever game you’re playing. The interior contains charts, definitions and abridged rules. The main purpose of the screen is to give the GM a handy reference for any situation that might come up, so that he doesn’t need to go flipping through the books and break the narrative flow of the game. But there’s an additional use for the GM screen, one much more sinister than rules and charts. 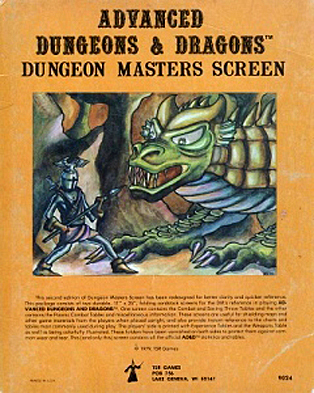 The screen allows the GM to keep secrets from her players. Want to keep your players alive a little bit longer but these darn skeletons keep rolling crits? Hide your rolls behind the screen and act like they keep missing! The players keep killing your big bad evil guys too fast? Jot down a few more hit points on their character sheets from behind the safety of your screen. Want to keep your players on their toes? Just roll randomly from behind the screen and pretend to check it against a chart. Be sure to look up at the PCs from time to time and make a relieved face, as if they narrowly missed a random encounter with a red dragon. The screen acts as a wall between the GM and his players. For some, the screen is an integral part of the game, not only because it offers quick access to rules and information, but for the explicit reason that it serves as a shield that keeps his actions secret. It allows the GM to remain separate from the players. Now, isn’t it more of a hindrance than it is an aid to the overall success of a game? If the goal of role-playing is to become immersed in another world, how does the GM screen affect that? 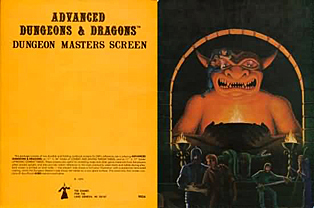 There are some who feel that the use of a screen sets up an antagonistic relationship at the table, that the use of a screen is something that excludes at least one person at the gaming table – namely, the GM. If the point of role-playing games is, as I’ve said so many times, to play a non-competitive cooperative game with friends, then the use of a GM screen creates at least one “other” at the table. There are the PCs and then the GM. Many of the GMs that I’ve talked to prefer to use a screen; they like the barrier between playing and GMing, and it’s not just a physical barrier either. That folded strip of cardboard also acts as a psychological barrier. It shows the PCs that the GM is privy to information that they may never know. The GM is not like them – he hovers above, aloof and godlike in his infinite wisdom. My personal feelings on the use of screens vary. It depends on how well I know the system and the type of story I’m telling. If I know the rules well enough, and the system supports more narrative than combat – such as Call of Cthulhu – then I’ll rarely use a screen. To have a screen up during a purely narrative game or scene, in my experience, works against the flow of the game. I want to tell a story, to set a mood and a tone. I want the players to trust me and listen to me and not think that I’m trying to lure them to their deaths. I do use a screen, but I’ll take it up and put it down as the story ebbs and flows. It will be up during combat and down during character and NPC interactions. I want my players to forget that they’re playing a game. I want them to forget that there are rules and that there are numbered targets that they need to hit. I don’t want them dumbing down their choices because they don’t think the rules will support it or that they won’t succeed, and if that means playing without a screen, then I’ll play without it. I’ve recently started GMing a weekly game of D&D, and I’ve been using a screen in pretty much every game. The missions are glorified dungeon hacks, and I have complicated maps that I’m using to keep track of the location of PCs, of enemies and of any information I’ll need to know as the heroes move from room to room. I also haven’t been using a battle map, in an effort to have my players ground themselves more firmly in their own imaginations. I use the screen to hide my maps and my rolls, and I’ve found that the players tend to be a bit cagier and more cautious. In our most recent game, the players attended a dinner party rife with nobles, knights and all manner of highfalutin’ folks. In this instance, encounters were purely based on role-playing and skill checks, and it felt more like a group of buddies sitting around a table playing a game than me running a game for a group of my buddies. There is, of course, no right or wrong way to play and it’s up to personal preference, but there are definite lines drawn in the philosophical sand between those who use screens and those who don’t. Is using a screen a crutch? A power trip? Is it useful for sustaining a compelling narrative, or is it something that should go the way of the dodo bird?